I watched entirely too much Food TV. I ate mass quantities of soup. I drank gallons of giner ale. 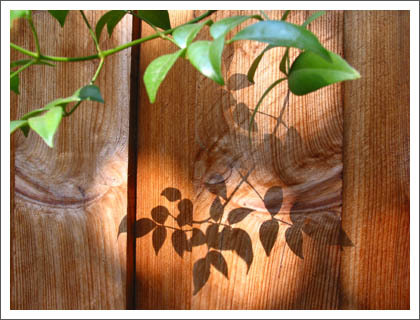 I noticed the lovely shadows from the afternoon sun hitting the fence. I finished knitting a scarf. I had an insatiable craving for ice-cream. P.S. Many thanks to my step-brother for finding out what kind of fungi is growing in my oregano. They have deflated quite a bit in the last few days, and will probably be dead in a few more. Goodbye strange fungi, we hardly knew ye. \nCanon Powershot G2\n\nWhile I was sick...\n\nI watched entirely too much Food TV.\n(Actually, I watched entirely too much tv. )\nI ate mass quantities of soup.\nI drank gallons of giner ale.\nI noticed the lovely shadows from the afternoon sun hitting the fence.\nI finished knitting a scarf.\nI had an insatiable craving for ice-cream.\n(Actually, that's more of an 'all the time' craving.)\n\nP.S. Many thanks to my step-brother for finding out what kind of fungi is growing in my oregano. They have deflated quite a bit in the last few days, and will probably be dead in a few more. Goodbye strange fungi, we hardly knew ye.